For one-semester undergraduate or master's level introductory courses in Biostatistics. 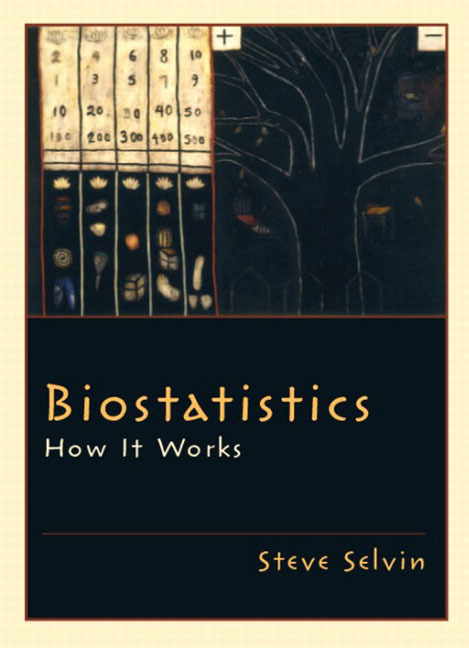 This concise, algebra-based text is a straight forward, clear approach to biostatistics, containing rigorous explanations of elementary methods without the “bells and whistles” associated with other books that cover this topic. Its goal is to provide a sophisticated introduction of how statistics works at a beginning level. Every concept is carefully and clearly explained, enriched by a mathematical/statistical justification, and then illustrated by at least one concrete, worked data example. Beginning with basic concepts, the text allows readers to acquire the ability to understand rather complicated statistical issues, such as linear regression theory and application. I. PROBABILITY: PROPERTIES OF SAMPLES. Summary Measures. Graphic Representation.2. Probability. Eight Rules of Probability. Composite Events. Bayes' Rule. Four Probability Problems.3. Random Variables. Random Variables. Joint Probability Distribution.4. Probability Distributions. Binominal Probability Distribution. Normal Profitability Distribution. Central Limit Theorem. II. STATISTICS: PROPERTIES OF SAMPLED POPULATIONS. Description of a Confidence Interval. Statistical Hypothesis Testing.6. Statistical Inference II. Student's t—Distribution. Computation of Sample Size.7. Chi-Square Analysis. Independence of Two Categorical Variables “r by c Table.”8. Linear Regression. Least Squares Estimation. Assessing an Estimated Regression Line. Assessing Regression Lines from Two Groups.9. Correlation. Testing a Correlation Coefficient. Confidence Interval for a Correlation Coefficient.References. B.1: Summation Notation. B.2: Derivation of the Normal Equations for Simple Linear Regression. B.3: Poisson Probability Distribution. B.4: Problem Sets: 1 to 15; B.5: Partial Solutions to Most Problems (Sets 1 to 15). Focus on elementary concepts for the beginner—This text is not the usual encyclopedia of statistical techniques. Does not attempt to delve into a large variety of methods and applications. Provides students with a clear, concise approach to statistical thinking, enabling them to understand often complicated material. Less than 400 pages—Contains a number of “real” problems, uses elementary mathematics (no calculus), and makes no mention of computer applications. Gives students a sophisticated and comprehensive introduction of how statistics works at a beginning level. Carefully-explained concepts—Enriched by mathematical/statistical justifications, and illustrated by concrete, worked examples. Enables students to understand biostatistics by following a consistent format throughout the text; provides instructors with a text that is sophisticated, cohesive and comprehensive. This text has a theme centered on the use of the sample mean value—The principles underlying this fundamental and relatively simple way to explore data are at the center of this text. Provides both kinds of students with a foundation for understanding how and why the statistical approach works. Simple algebraic explanations as “proofs”—Enclosed in boxes. Gives students another way to understand statistical concepts, providing keen insight into the statistical process. Provides students with an easy reference tool. Instructor's Solutions Manual—Accompanies the text. Provides instructors with valuable course support.